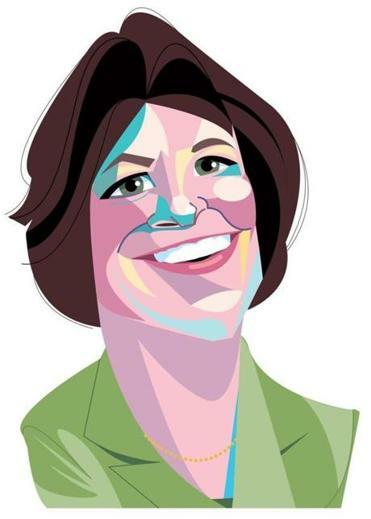 Nice cameo in yesterday’s Boston Globe of legal eagle Tracy Miner’s flight from her old law firm to her own. Tracy Miner would tell you that there aren’t many woman-owned law firms that specialize in criminal work. That’s probably true. But you know what’s also rare? Lawyers who start their own firms while they’re in the midst of one of the city’s biggest white-collar criminal trials. Miner can claim both honors. She launched Miner Orkand Siddall LP earlier this month, just as the Insys Therapeutics trial was getting underway. The racketeering case revolves around federal prosecutors’ claims that Insys executives improperly marketed the painkiller Subsys to doctors. Miner represents Mike Gurry, a former vice president at the drug company and one of the defendants in the case. But the normally buttoned-down Chesto inexplicably fails to mention Miner’s highest profile current client: Bryon Hefner, the estranged husband of former State Senate President Stan Rosenberg. Last we saw, Hefner – who’s been accused by several men of sexual assault – goes on trial March 25. Not exactly a minor omission. Considering Chesto’s track record, though, give him a mulligan, eh? 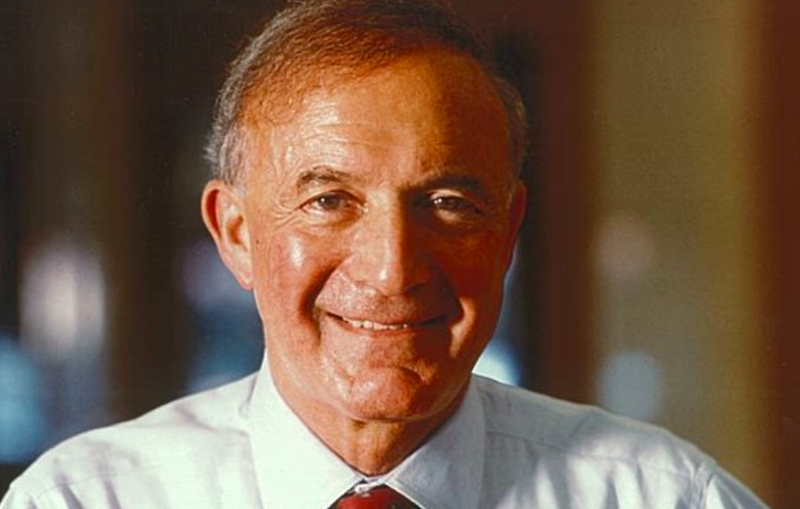 In the eyes of some Bostonians, real estate magnate Harold Brown, who died on Sunday at the age of 94, was a legendary slumlord; to others he was a storied landlord and philanthropist. In the local dailies he was both – but in separate papers. The first sendoff came in yesterday’s Boston Herald, with the main source for Sean Philip Cotter’s piece being Brown’s rabbi. 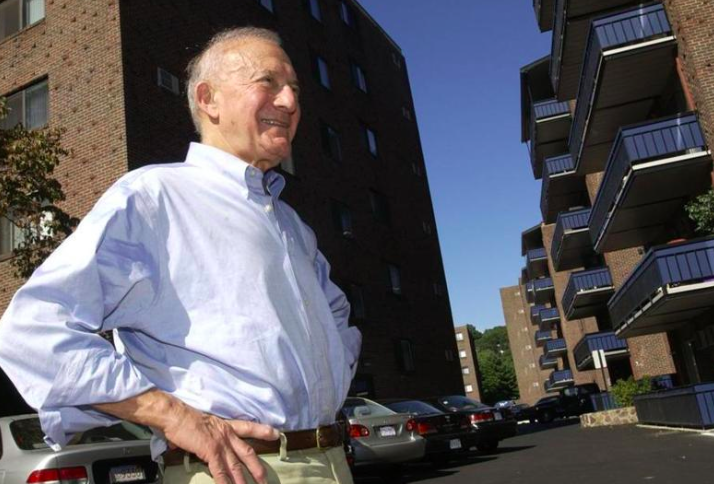 Harold Brown, the storied Boston landlord who turned one small apartment building into a sprawling real estate empire, has died, according to his rabbi. He was 94. 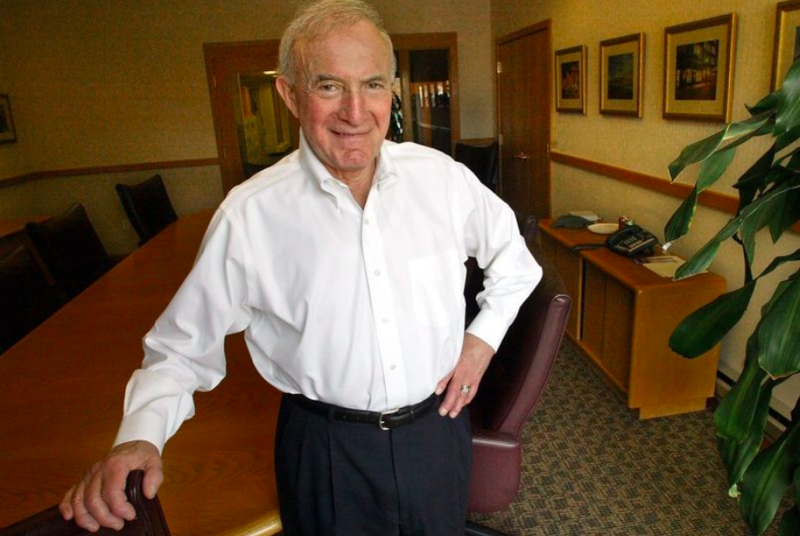 Brown, who retired from his position atop Hamilton Co. at age 93 last year, amassed billions of dollars worth of Boston-area property over more than six decades in the real estate business and created a charitable foundation that gave to local causes. Today the frothy local tabloid features this piece on the Obituaries page, which described Brown as being “[k]nown for his quick wit, no-nonsense approach and generosity.” But apparently that wasn’t enough hagiography for the Herald, because Howie Carr also weighs in today with this mash note. Harold Brown was a friend of mine. He was good to me, my family, and a lot of other people. Talk about up by the bootstraps — his mother was a fortuneteller, that’s how she put food on the table during the Depression. He was a veteran of both World War II and Korea. When he died on Sunday, at age 94, Harold Brown was probably worth well over $1 billion. He had long ago set up a giant charitable foundation. If you walked through the door of his modest offices on Brighton Avenue with your hand out, chances are, you and your group got taken care of. The rest of the column is classic whataboutism: Everyone greased politicians, Brown just forgot to delegate his bribery. Hey! – the Kennedys were slumlords too. That 75 State Street scandal? Brown was the victim of Whitey Bulger, not the scammer. 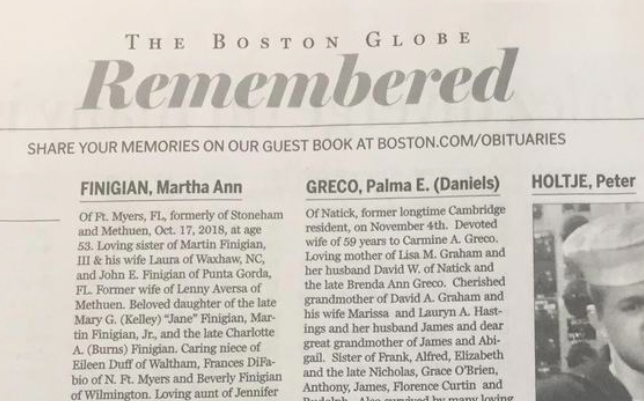 Crosstown at the Boston Globe, Brown’s life is a very different story, although Bryan Marquard’s obit starts off in standard style. Harold Brown liked to tell the story of growing up so poor that his immigrant mother padlocked the icebox between meals to keep her seven hungry children from pilfering food the family would need for its next meal. Years later he was faring better. In the mid-1950s, fresh from the success of building a doughnut shop chain, he bought his first rental property — a Commonwealth Avenue apartment building. One purchase led to another as he created a formidable real estate empire that his company estimates at $2.3 billion. 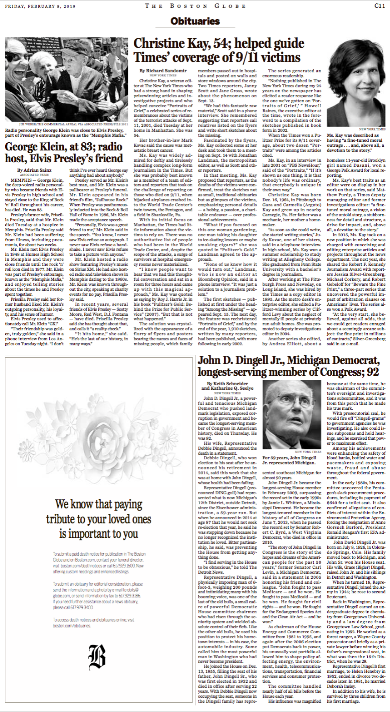 The Globe obit gives a more straightforward recounting of Brown’s legal woes and financial shenanigans, from a federal bribery conviction in 1986 to his 1991 filing for bankruptcy protection when he was $650 million in debt. 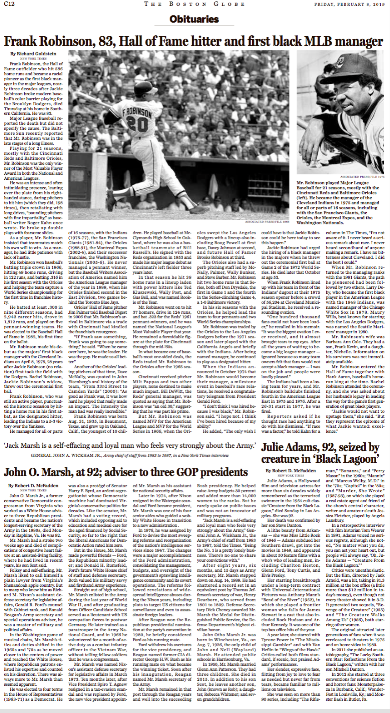 But the Globe also gives him his due on the business side (“At one point in the 1980s . . . Mr. Brown’s holdings were so expansive that he estimated he collected rent from one of every 15 tenants in Greater Boston”) and on the philanthropic front, from his establishing The Hamilton Company Charitable Foundation and contributing to Franciscan Children’s to rescuing the Coolidge Corner Theatre and donating a $2.3 million building to house the Fenway Community Health Center. Taken all together, that’s exactly why you want to live in a two-daily town. 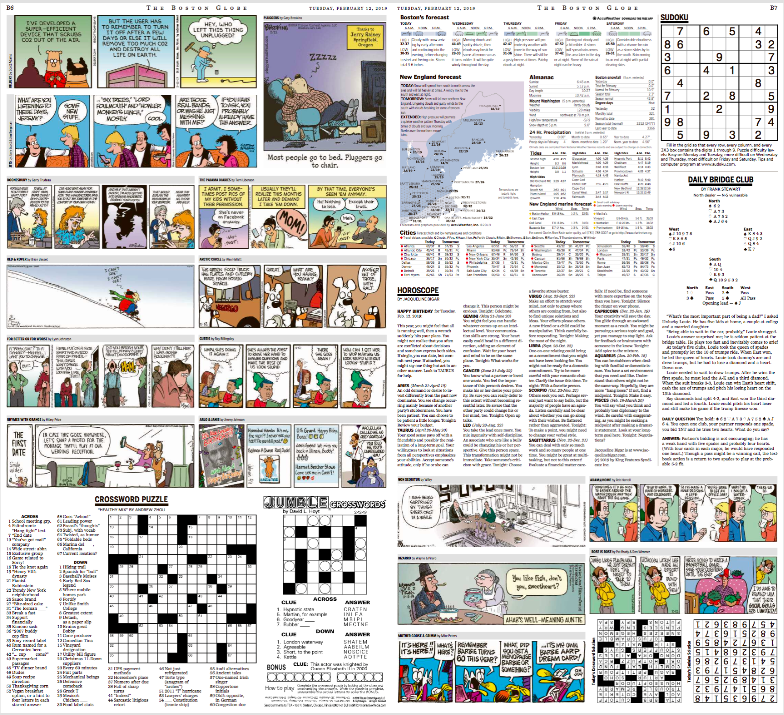 As the hardreading staff has diligently chronicled, the Boston Globe joined dozens of other newspapers in dumping Non Sequitur for inviting Donald Trump to do something anatomically impossible in its comic strip last week. 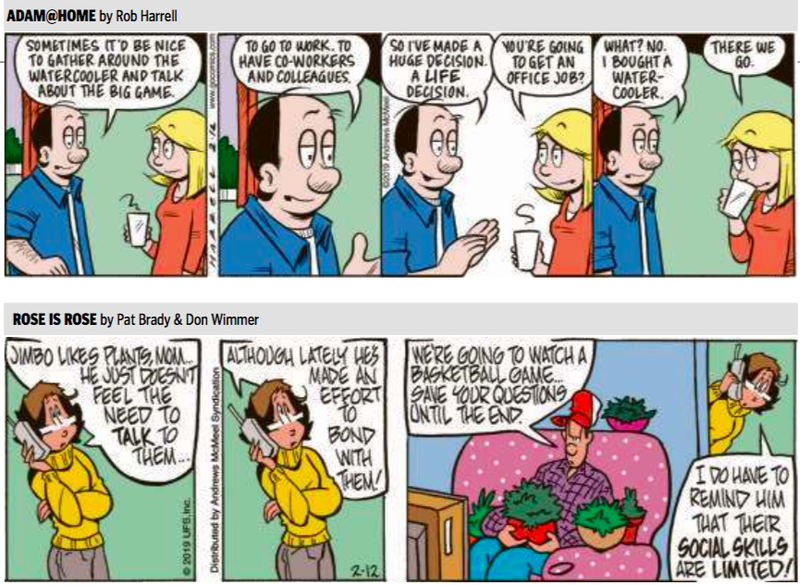 In yesterday’s Boston Herald comics page, Pearls Before Swine offered this commentary. 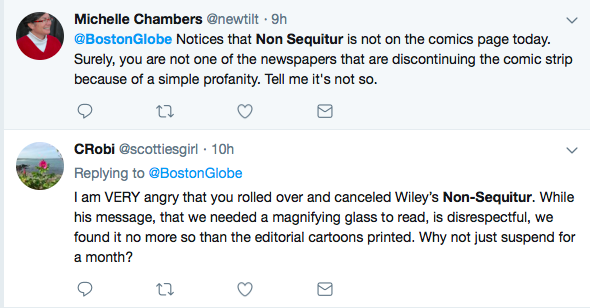 Beyond that, Two Daily Town has received several protests to the Globe’s defenestration of Non Sequitur. Draw, as it were, your own conclusions. As the hardreading staff has previously noted, the Boston Globe had no immediate reaction to last Sunday’s Non Sequitur comic, which contained what was widely described as a “profane and vulgar” message to Donald Trump inviting him to do something, well, anatomically impossible. 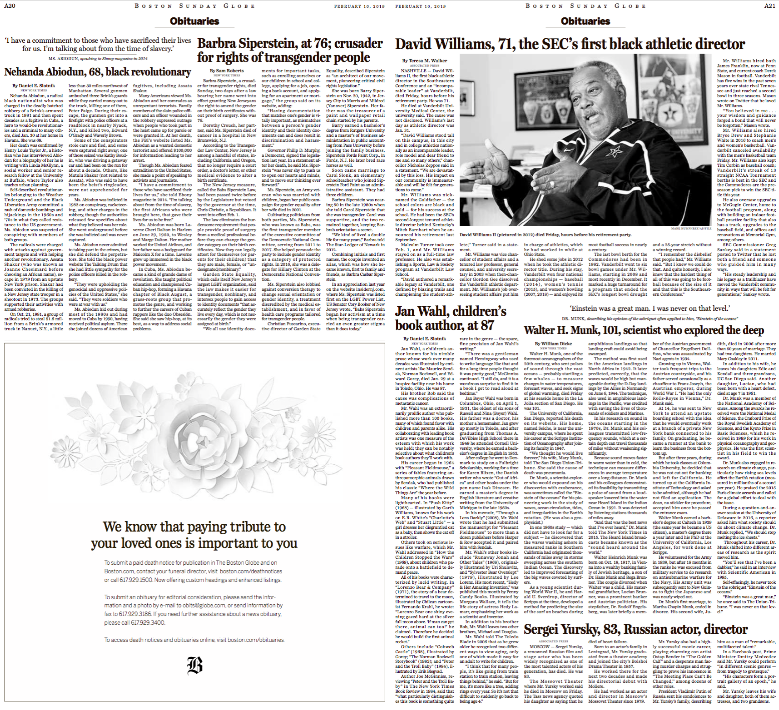 All week newspapers have been busy dropping the strip (The Daily Cartoonist stopped counting at 45), and today the Globe followed suit with this Page 2 editor’s note. So, instead of this on today’s comics pages . . . If Non Sequitur had to go (which, in truth, it didn’t), Zippy the Pinhead is an excellent replacement. To be sure, there were a couple of protests on Twitter. But that’s pretty much all the blowback we saw. According to the editor’s note, the Sunday Globe will continue to stiff Zippy, opting instead for Half Full, which is, to be fair, half funny. Hey – six out of seven Zippys ain’t bad. 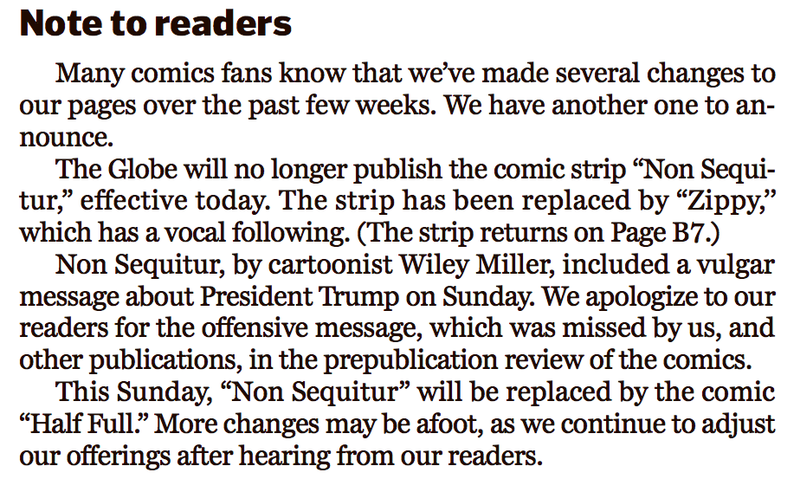 As the hardreading staff noted yesterday, the strip has hit the fan over Wiley Miller’s Non Sequitur comic on Sunday, which featured this smash note for Donald Trump (it’s now been erased from the web version). That caused a number of papers to drop the strip, including the Richmond Times-Dispatch, Butler (PA) Eagle, Orlando Sentinel, the Sun Sentinel of South Florida, the Post Bulletin of Rochester, MN, the Post-Standard of Syracuse, the Columbus Dispatch, and . . . well, tally them yourself here. But not, as yet, the Boston Globe. So we tweeted this a couple of hours ago to Globe editor Brian McGrory. All this mishegas coincides with yesterday’s launch of the expanded Globe comics pages, which now look like this. As it happens, the four restored comics – Mother Goose & Grimm, Bizarro, Rose Is Rose, and Adam @ Home – share the kiddie table on the right with Non Sequitur. Memo to Globe readers who voted for Rose Is Rose and Adam@Home: Here’s what you brought back to the party. When you could’ve had this . . .
As Indiana Jones might say, you chose poorly. 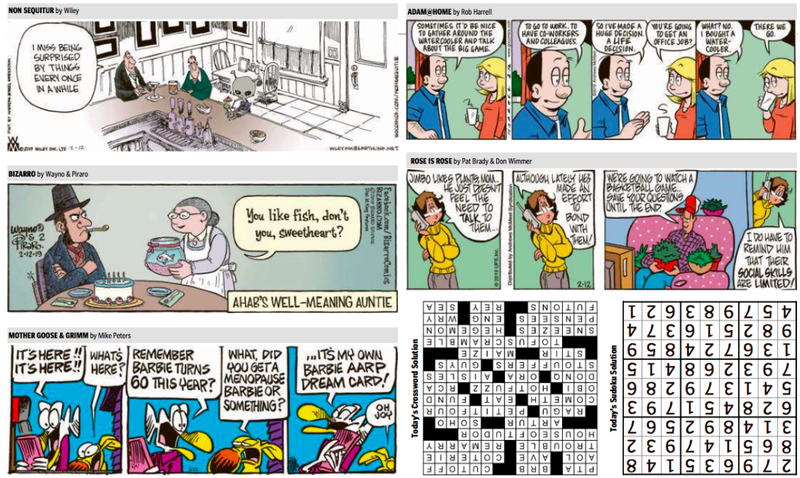 Well the strip has really hit the fan over Wiley Miller’s Non Sequitur comic on Sunday, and the Boston Globe is in it up to its eyeballs. Problem is, tucked into the middle of the strip was this exhortation to Donald Trump. As we write this, two newspapers – the Richmond Times-Dispatch and the Butler Eagle – have dropped the strip, and the Twitterverse is relatively calm. We doubt it will remain that way. And we look forward to the Globe’s reaction to the rumpus. Feels like a lose-lose, no? You are currently browsing the It's Good to Live in a Two-Daily Town blog archives for February, 2019.